Just in time for the May 21 Armageddon, this parody and re-imaginings of da Vinci’s “The Last Supper” mixes Mexican culture with Cholo and Pachuco culture. Chris Parks transports us to the ‘Last Fiesta,’ a fresh take on the genre, starring gang-sign-throwing Mexican Luchadores surrounded by their various cultural exports. Every now and then you come across artwork that is either really interesting or really controversial. And though we’re not quite sure what to make of skateboard designer Chris Parks’ luchador inspired “Last Fiesta,” it’s definitely scoring a lot of traction on the world wide web and it's "a huevo". 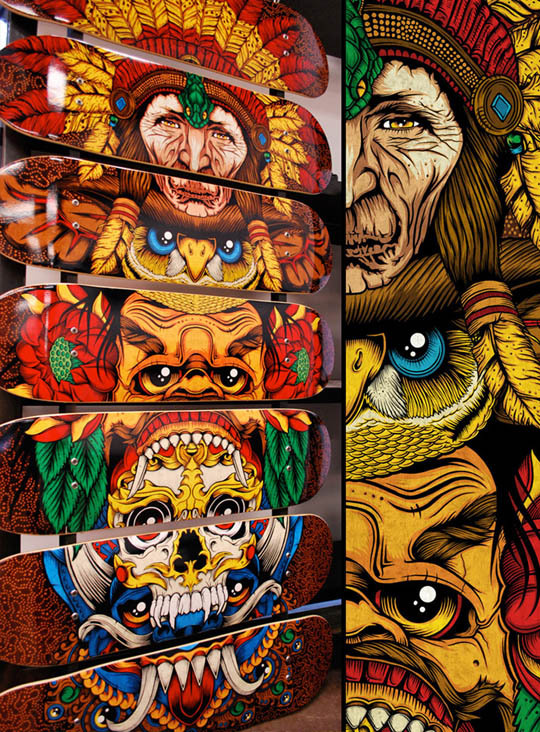 Spread across a dozen skateboards, “The Last Fiesta” depicts twelve Mexican wrestler apostles and a character Parks calls Jesus Christos gathered at a dinner table. 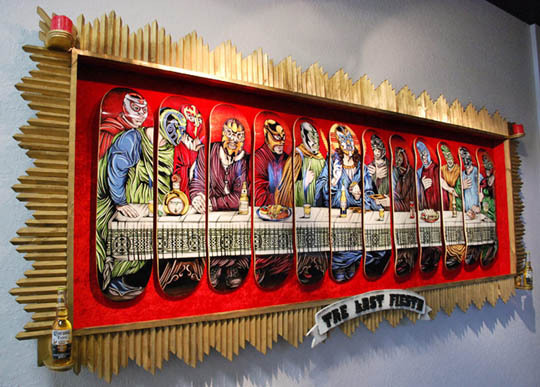 It’s obviously a nod to Leonardo da Vinci’s “Last Supper” portrait of Jesus Christ, but there are a few elements that may qualify it as offensive. For one thing, the masked Christos is eating a taco al pastor con todo, complete with a Corona and limón. The “apostles” all have shot glasses filled with Don Julio tequila and arroz a la Mexicana con frijoles… Does that border on a racial stereotype? Parks certainly doesn’t think so. Regardless about how you feel about the religious and racial undertones, there is no denying that Chris Parks is a superb artist. But seeing this piece’s controversial nature makes us doubt that P. Rod will be grinding rails on Jesus Christos anytime soon.